Mayo Dark Sky Park: - Site de chasseursdenuits ! Numbers are associated with sites on the map. Dowload the program (in French, English and Spanish). - Planetarium sessions in collaboration with Ré Astro -> Espace Robert Hossein, Lourdes (N ° 1): Booking at ra17@hotmail.fr (4 € per person). 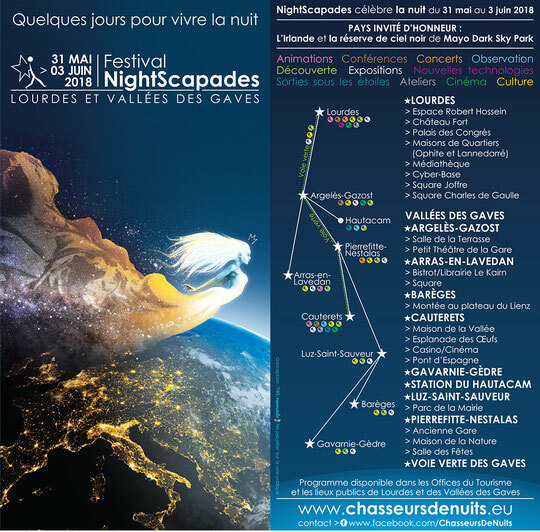 Every year NightScapades invites a country to come and present its starry sky reserve. For its first edition in Lourdes, NightScapades will receive the Mayo Dark Sky Park in Ireland. The night sky has captivated the Irish for millennia. Nearly 6,000 years ago, the Neolithic inhabitants of the Iveragh Peninsula built stone monuments incorporating alignments to follow the cycles of the Sun, Moon and stars. According to some experts, ancient Ogham inscriptions found in the area could represent celestial observations. Formal responsibility for Mayo Dark Sky Park lies with the National Parks & Wildlife Service who have committed to a responsible lighting plan for the Dark Sky Park.